Being too close to energy-saving light bulbs could cause skin reddening because of ultraviolet light emissions, health experts have warned. The Health Protection Agency (HPA) cautions against being closer than 30cm (1ft) to some compact fluorescent (cfl) bulbs for long. But it added there is no evidence that such bulbs pose a cancer threat. 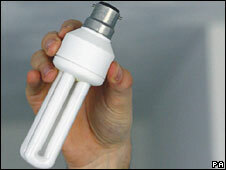 Enclosed CFL lights - where the coil is covered like a traditional bulb - are safer, it advised. The agency says that UV light equivalent to being outside on a sunny day is being emitted by some bulbs, but if the coil is not visible the issue is prevented. The HPA said it was prompted to investigate the bulbs after being approached by groups representing people who suffer from light sensitivity issues. As a result of testing which revealed the potentially high levels of UV light, the HPA has issued guidelines against people using unencapsulated light bulbs - where the light coil is visible - closer than 30cms to the body for more than one hour a day. However, the agency stressed families should not remove energy-saving light bulbs from their homes, adding that there was no risk of skin cancer. "We are not saying these could cause cancer," said HPA chief executive Justin McCracken said. "At the exposure levels we are talking about the worst effect that we believe there is as result of our investigation is that people could have some short-time reddening of their skin." The HPA's experts are thought to be the first in the world to spot the problem and they have called on the EU, manufacturers and the bodies which set standards related to the bulbs, to work on tightening the rules around their creation and use. No one manufacturer was singled out by the research which is due to be published in an academic journal. About one in five unencapsulated bulbs was found to have UV radiation emissions from a pool of 20 encapsulated and 53 unencapsulated which were tested. Dr John O'Hagan, group leader of the HPA's Radiation Protection Division, said his research had suggested the problem may be caused by issues such as phosphor, bends in the glass or the quality of the glass. Professor Harry Moseley, Consultant Clinical Scientist at the University of Dundee, said: "We are concerned about risks to patients who have severe light-sensitive skin disorders. "The small levels of ultra-violet emitted by some low energy light bulbs could be harmful to these patients. I recommend use of lights with a protective shield to absorb the UV." Experts stress that healthy people are at no risk providing the HPAs advice is followed. Industry group the Lighting Association worked with the HPA on the results of this study and has commissioned further independent research into the claims, although it did welcome the precautionary advice issued.